Check out some of the highlights of Allegheny GoatScape's work below. Want to see more photos of the goats in action? Visit us on Facebook or Instagram. To read recent updates of the herds’ work, check out our most recent edition of The Browser here. Team Diamond (named for the mini donkey in the herd) ate through the invasive plants along the bank of the Monongahela River throughout 2018 season! They began under the Homestead Grays Bridge along the Great Allegheny Passage trail, moving east in Homestead. Once they reached Eat N’ Park, they moved down to the Waterfront Apartments and continued to eat away at the unwanted vegetation, bringing the river into view! The Waterfront Association has been a great partner in this year-long project! Team Hobo began the 2018 eating season at beautiful Winnie Palmer Nature Reserve, part of St. Vincent College, in Latrobe. They ate up the first poison ivy, honeysuckle and bramble to show along paths in this picturesque space. The herd’s charge was to clear the way so that natural outdoor spaces for learning, gathering and playing could take shape in this wonderful space. Team Hobo came to South Side Park again in 2018 thanks to the Hilltop Alliance and Friends of South Side Park. Allegheny County Conservation District generously provided a grant through their Conservation Leadership and Innovation Program (CLIP) to Hilltop Alliance to make this happen. The herd worked their way through wild grape vines and porcelain berry that have enveloped an area of the park known to neighbors as Jurassic Valley. The herd was also a focal point for the 2nd Annual GoatFest in July, bringing nearly 5,600 people to enjoy this unique natural asset tucked away in Pittsburgh’s South Side Slopes. 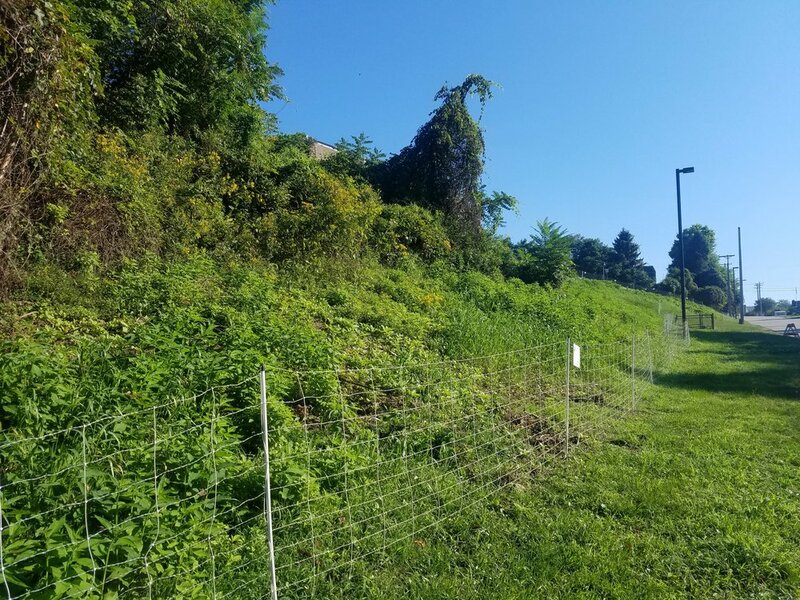 Team Hobo enjoyed three separate locations on Penn State - Greater Allegheny’s campus, eating through two acres of dense vines and other brush, providing an opportunity to enact the staff’s maintenance plan in difficult to landscape hillsides and locations. University staff and students kept a close eye on Team Hobo as they worked throughout the month of September, providing invaluable help during some of the most intense weather our region has had in many years. Allegheny GoatScape made a return to Carnegie Mellon University’s campus in Pittsburgh. This location is quickly becoming one of the herd’s favorite spots to munch. The herd again tackled the hillside between the Purnell Center for the Arts, the Gates Center for Computer Science and Pausch Bridge. The herd worked through the same space in 2018 as in 2017, but took a whole day less, showing that their efforts for reducing vegetation is working! Thanks to a generous grant from the EQT Foundation, Allegheny GoatScape is able to work with Pittsburgh Parks Conservancy and City of Pittsburgh Department of Public Works in Frick Park to help restore a few acres that had been taken over by Japanese bush honeysuckle, mile-a-minute and other unwanted vines. The goats worked quickly to complete the year, tackling 3.5 acres in just under a month! They will be back again in the spring to eat plants in the space before Parks staff plants restoration ground cover and trees to foster a habitat more conducive to Western Pennsylvania.